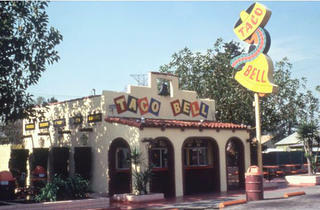 Taco Bell was founded by fast food entrepreneur Glen Bell in Downey, California, in 1962. It started with some hard-shell tacos and a dream. Glen Bell, founder of the international fast food chain Taco Bell, opened his very first restaurant of that name in a modest 20-by-20 foot Mission-style building in Downey, California, in 1962. He thought that crunchy taco shells would make the traditional Mexican fare more fast food friendly, and that the American public would eat it up. He was right. Fifty-three years later, there are roughly 6,000 Taco Bell restaurants in the U.S. The small cinderblock building in Downey where mass-market Mexican food arguably began, though, faces an uncertain future. 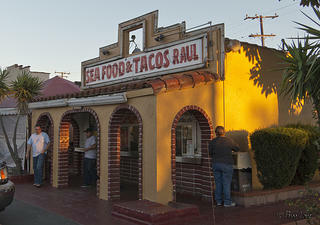 Although the structure hasn’t held a Taco Bell for close to two decades, it has played host to a number of other taco joints, the most recent being local chain Seafood and Tacos Raul. After that restaurant closed in December 2014, members of local preservationist group the Downey Conservancy became concerned that the building was under threat of demolition. “It’s sitting there, I guess you could say in limbo. The owner wants the property cleared,” says George Redfox, who leads the Conservancy. He says that the building is actually in fairly good structural shape, and that moving it off the lot might be another possibility for saving it. When Taco Bell’s social media team got wind of the news that their company’s first-ever taco shrine was threatened, they responded with the hashtag #SaveTacoBell, sparking a Twitter-wide frenzy. Coverage from news outlets like Business Insider and Architizer’s blog provided further exposure, rallying vocal support for its preservation. Redfox soon heard from Taco Bell’s corporate offices in Irvine -- the company was interested in potentially helping to save the structure. The Downey Conservancy has been working with Taco Bell in recent weeks to explore reuse options. Seafood and Tacos Raul, the restaurant that most recently occupied the building, closed in December of 2014. So could the building potentially become a Taco Bell once again? Matthew Prince, a public relations manager for the company, says that might be a possibility, if it turns out that the building is viable. One major consideration, of course, is its size; the original Taco Bell restaurant was a walk-up counter and didn’t house much more than kitchen facilities. The building doesn't currently hold any historic designations. The development company that owns the building, Andrews Rancho del Sur, hasn’t made any public comment about what their plans for the structure are. Downey is a city rich with fast-food history: It’s also home to the world’s oldest operating McDonald’s restaurant, which opened in 1953. The building’s red-and-white striped tile exterior has been carefully preserved, as well as its walk-up window and outdoor seating. A more recent addition houses a museum and gift shop dedicated to McDonald’s history. This could offer one potential reuse model for the Taco Bell building, if, as Redfox explains, some of the grant options that the Conservancy is currently exploring pan out.